**** The hogging moment could have been considered at face of support to reduce the amount of reinforcement required. 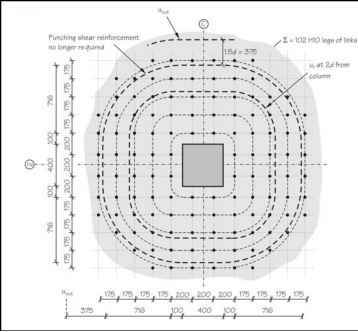 This should be balanced against the effect of the presence of a 200 x 200 hole at some supports which would have the effect of increasing K but not unduly increasing the total amount of reinforcement required in the column strip (a 1.5% increase in total area would been required). Within = 0.125 x 6.0 m = 750 mm of the column centreline. Consider panel on grid line 2 as being 9.6 / 2 + 8.6 / 2 = 9.1 m wide and continuous spans of 6.0 m. Column strip is 6.0 / 3 = 3.0 m wide.